Research in silicone rubber yields a strange by-product that may have its own uses. Exceptional resistance to heat characterizes silicone rubber, an entirely new synthetic product developed by General Electric research engineers. Rings of the material now replace asbestos to cushion the glass of naval searchlights and blinker signal lamps against the terrific shock of gunfire, materially reducing breakage. 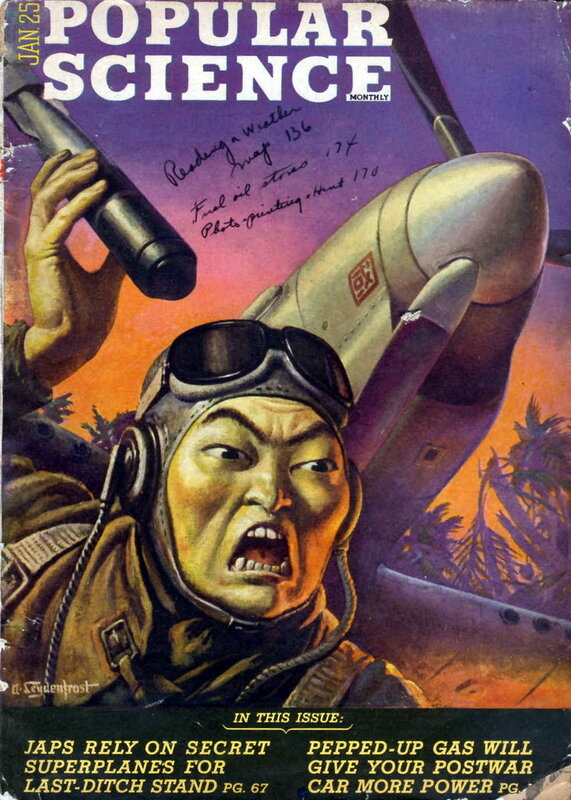 Gaskets of the same composition serve in super-chargers for the B-29 Superfortresses that bomb Japan. These two war uses currently consume the entire output, but future household and industrial applications may include tires that will outlast a car, garden hose that can be left outdoors in heat or cold without damage, rubber gloves, and mountings for radio tubes. Known for 50 years, chemicals called silicones have only recently been put to work. Hybrids between organic an inorganic substances, their ingredients are similar to sand and natural gas. A molecule of ordinary rubber has a “backbone” of carbon atoms, but a molecule of silicone rubber contains a more nearly indestructible spine of silicon and oxygen. Besides silicone rubber, newly useful members of this chemical family include silicone oil, for hydraulic systems such as car brakes, and silicon plastics. 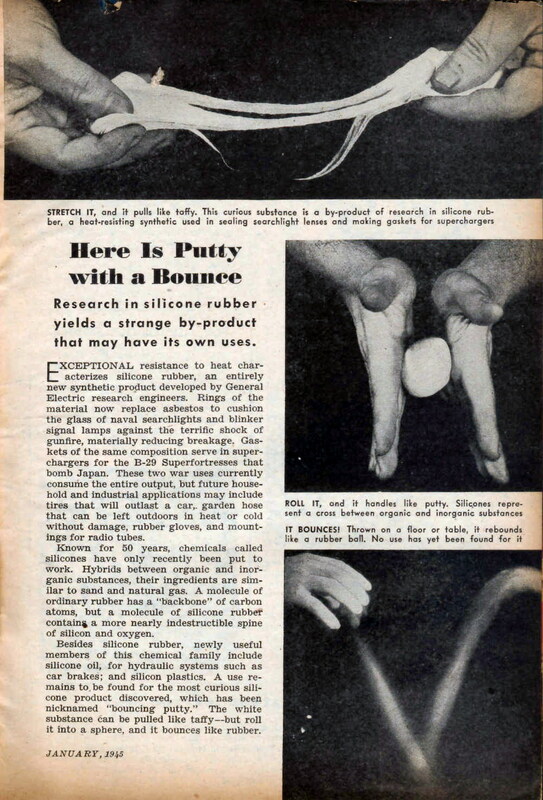 A use remains to be found for the most curious silicone product discovered which has been nicknamed “bouncing putty.” The white substance can be pulled like taffy – but roll it into a sphere, and it bounces like rubber. Flatten it against a newspaper, and it would lift the print, too. Oughta bring it back as a toy again. Ah! So THAT’s what it was!! Long ago when Disney’s “Flubber” remake (with Robin Williams) came out, amongst many other toys they branded, they released a kind of silly putty branded under the flubber name which was precisely this. It was perfect as a flubber toy as the ability for it to bounce when made into a ball is kinda what the real flubber does in the movie. After some months it would go weird though.